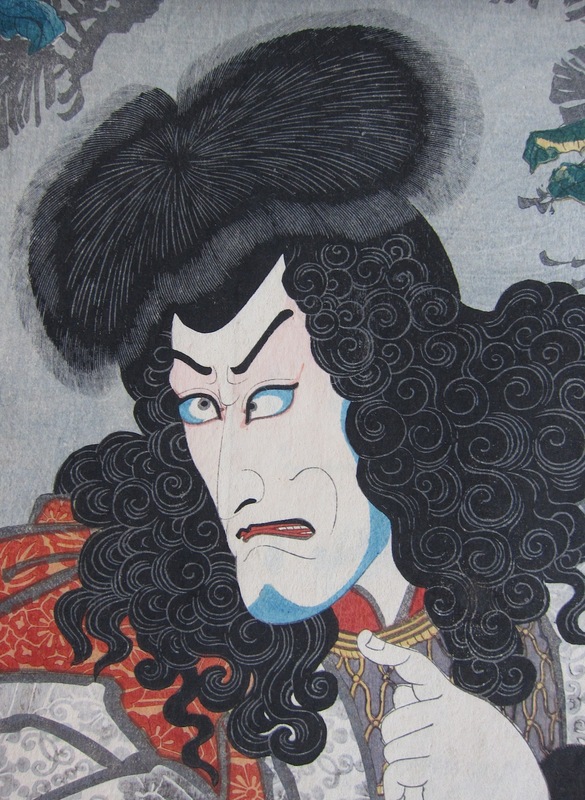 Utagawa Kuniyoshi (1797-1861) The Actor Ichikawa Ebizo V as Inuyama Dosetsu from The Loyal Heroes of Bakin’s Hakkenden (Giyu Hakkenden), 1847 - 1848. Oban. This terrific Kuniyoshi print represents Inuyama Dosetsu, one of the Eight Dog Heroes (Hakkenden) - eight brothers who feature in the extraordinary 106 volume novel The Eight Dog Chronicles, written by Kyokutei Bakin (1767 - 1848). The complex plot centres on the eight offspring of a supernatural marriage between a princess and her father’s dog. Shamed at the birth of her children, she kills herself and the eight beads of her rosary, each representing a Buddhist virtue, become crystal orbs and disperse, the children being reborn to normal mothers sixteen years later. Dosetsu’s Confucian gift is loyalty (Chu), a gift imposed on him by the gods along with the magical ability to manipulate fire and water. 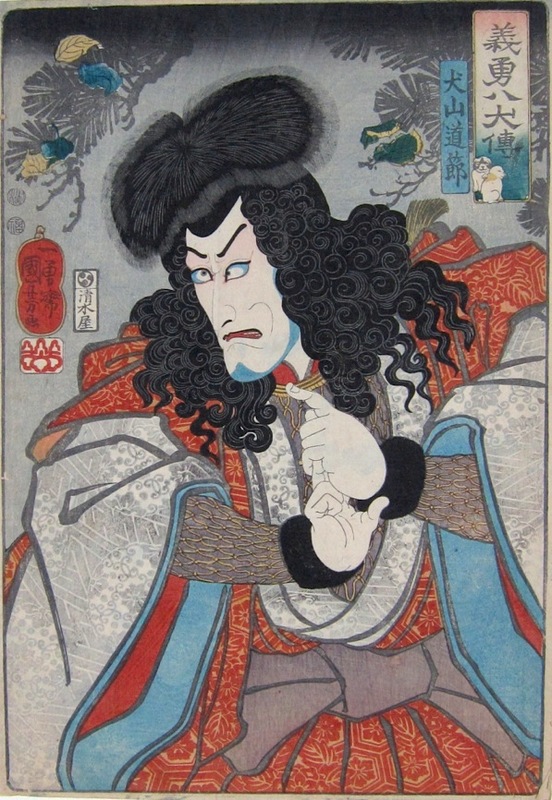 The novel became a popular kabuki play (Nanso Satomi Hakkenden), and Kuniyoshi shows the actor Ichikawa Ebizo in the role of Dosetsu making a a magical sign with his hands. The climax of the drama features Dosetsu in a dramatic rooftop fight followed by his magical escape through the air, carrying on his back an enormous basket containing two other cast members. This is such a fine design; there is more than a little of the contemporary representations of Captain Hook or Jack Sparrow in the great tumbles of ringlets and the deep eyebrows of the magician. Kuniyoshi has drawn two puppies in his typical style in the upper cartouche as reference to the novel. The surface of the print is rich with decoration and detail and the print writhes with the pent up fury of the character. This is an early edition - later editions have the cartouche in solid red - and there is woodgrain visible in the background greys. Full size with some margins, fine colour and impression, some wear but over all very good condition.